July has brought “Paris Fashion Week and Haute Couture”, fashion glam had covered the city of love, as a fresh breeze in this hot Parisian summer. Models cover in gold satin had astonished the world with the genius creations of Dany Atrache, his collection is breathtaking, He makes beautiful gowns, and he turns a woman to muse, giving all glamour and beauty, Dany has created elegant Divas with romantic style, with the help of soft fabrics as organza, lace, guipure, silk, silk crepe and satin. He becomes a fashion’s poet someone who leads a confident woman to show off her feminine silhouette to its maximum potential. Dany presents this week in Paris, elaborate creations in satin, magnificent embroideries dresses, that I am sure, I will see on many red carpets, Perhaps even a perfect proposal for some important event of our lives. Here is the catwalk presented by the designer Dany Atrache for the Autumn / Winter 2017-18 collection. Julio ha traido “La semana de la Moda y La alta costura a Paris”, para refrescarnos del calor sofocante de este verano Parisino, se nos presenta un genio de las pasarelas de la alta costura; él, ha hecho posible un magestuoso desfile de moda, que nos ha dejado con la boca abierta, por su esplendor. Su trabajo enbelleze a las mujeres dandoles un glamour y divinidad que solo ellas se merecen, Dany ha creado Divas con valor en oro!! mostrando atuendos elegantes, romanticos, y cautivadores rezaltando la silueta femenina a su máximo potencial, el movimiento de la suavidad de sus telas va creando un poema en la moda, y lleva a la mujer actual a mostrar una cara más segura y confiada de si misma. Con un manego de telas sutiles Dany nos presenta creaciones esquisitas en satin, gasas que flotan en el viento, magnificos bordados, vestidos que seguro veremos en numerosas alfombras rojas, y por que no en algun evento importante de nuestras vidas he aqui el desfile y la propuesta que nos presenta el diseñador Dany Atrache para la collección Otoño/ Invierno 2017-18. Haute couture French for “high sewing” or “high dressmaking” or “high fashion”) is the creation of exclusive custom-fitted clothing. Haute couture is high-end fashion that is constructed by hand from start to finish, made from high-quality, expensive, often unusual fabric and sewn with extreme attention to detail and finished by the most experienced and capable sewers, often using time-consuming, hand-executed techniques. 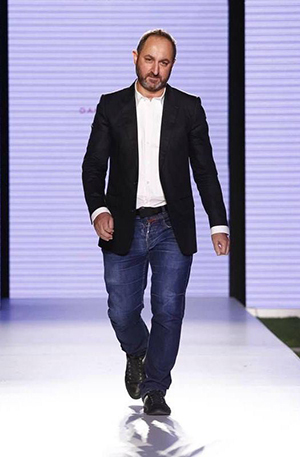 Dany Atrache, a French-Lebanese fashion designer, is considered one of the leading fashion trendsetters in the MEA. After working for 12 years in Paris with top French fashion houses including Dior, Montana and Torrente Uniforme, Dany decided to return to Lebanon with the goal of turning his fashion dreams into reality. His aspiration, creativity, ambition and hard work led to the launch of his own couture line in 2000. His stunning collection premiered at his first runway show in Beirut mesmerising the audience with the exclusive designs. In no time, he was dressing the stars and celebrities of the Arab entertainment world with his unique and exquisite pieces. Following his great success in Beirut, he expanded his shows to Paris where he hosted his first private fashion show in 2004. He continues to regularly present unforgettable collections during the famed Paris Haute Couture season. Inspired by the rich tapestry of his culture, perfected by a European savoir-faire, Dany Atrache’s style weaves together unique fabrics and elements that enchant us with his star-studded style. His “East meets West style” along with his touch of elegance, glamour, ingenuity and passion for great versatility are what bring this young designer’s collection to life. The use of unexpected materials, remarkable creativity, lavish designs and unconventional colours, along with his attention to detail and ability to transcend the current trends, have placed Dany Atrache at the forefront of influential fashion designers.In 2007, he expanded his line and launched his ready-to-wear collection, “D by Dany Atrache”.Early this year, he inaugurated his first boutique located in Beirut. The boutique showcases a wide selection of ready- to- wear and a collection of trendy accessories. Dany Atrache, un diseñador de moda franco-libanes, su trabajo es considerado dentro de las principales tendencias de la moda en el MEA. Después de trabajar durante 12 años en París con las mejores casas de moda francesas como Dior, Montana y Torrente Uniforme, Dany decidió regresar al Líbano con el objetivo de convertir sus sueños de moda en realidad. Su aspiración, creatividad, ambición y trabajo duro condujeron al lanzamiento de su propia línea de costura en el 2000. Su impresionante colección se estrenó con exito en Beirut fascinando a la audiencia con los diseños exclusivos. Al poco tiempo él se encontraria vistiendo a las estrellas y celebridades del mundo del entretenimiento árabe con sus piezas únicas y exquisitas. Después de su gran éxito en Beirut, amplió sus espectáculos a París, donde organizó su primer desfile de moda privado en 2004. Siguió presentando regularmente colecciones inolvidables durante la famosa temporada de Haute Couture de París. Inspirado por el rico tapiz de su cultura, perfeccionado por un savoir faire europeo, el estilo de Dany Atrache teje tejidos únicos, elementos que nos encantan, con su estilo estrella. Su “East meets West style”, su toque de elegancia, glamour, pasión e ingenio inspiran la gran versatilidad, de este joven diseñador. Dany nos presenta materiales inesperados, una creatividad notable, diseños lujosos y colores no convencionales, el diseñador posee una gran atención a los detalle y la capacidad de trascender la nuevas tendencias, Dany Atrache se ha posicionado a la vanguardia de los diseñadores. En 2007, amplió su línea y lanzó Su colección de prêt-à-porter, “D by Dany Atrache”. Ese mismo año, inauguró su primera boutique ubicada en Beirut. La boutique presenta una amplia selección de prêt-à-porter y una colección de accesorios de moda. Previous ArticleKing Arthur legend what do we know / La leyenda del Rey Arturo que es lo que se sabe.